Interstate 57 is one of two major north-south Interstates serving downstate Illinois. 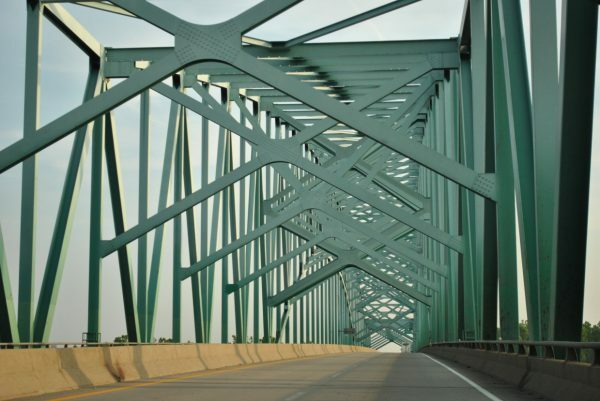 It provides an alternative to Interstate 55 between Sikeston and Chicago by avoiding St. Louis. The freeway initially runs east from Sikeston to Charleston, Missouri before curving northeast to span the Mississippi River. The remainder of the freeway ventures north though mostly rural environs. Interstate 57 crosses the Mississippi River on a steel through arch bridge that was built in 1978. Photo taken 06/01/11. South of Marion, Interstate 57 gains traffic from the ending Interstate 24 leading northwest from Nashville, Clarksville and Paducah. Some truck traffic peels off I-57 for Interstate 64 west from Mount Vernon to the St. Louis area. Through Mt. Vernon, I-57 & 64 share a five mile overlap. Beyond Mount Vernon, I-57 ventures north to Salem before turning northeast to Effingham and a six-mile overlap with Interstate 70. I-70 carries a substantial amount of truck traffic between St. Louis and Indianapolis, adding to the busy cosigned section with I-57. North from Effingham, Interstate 57 continues to Mattoon, Champaign, Kankakee and the south suburbs of Chicago. Within Chicago, Interstate 57 is one of the few freeways that is referred to by its number rather than an expressway name. 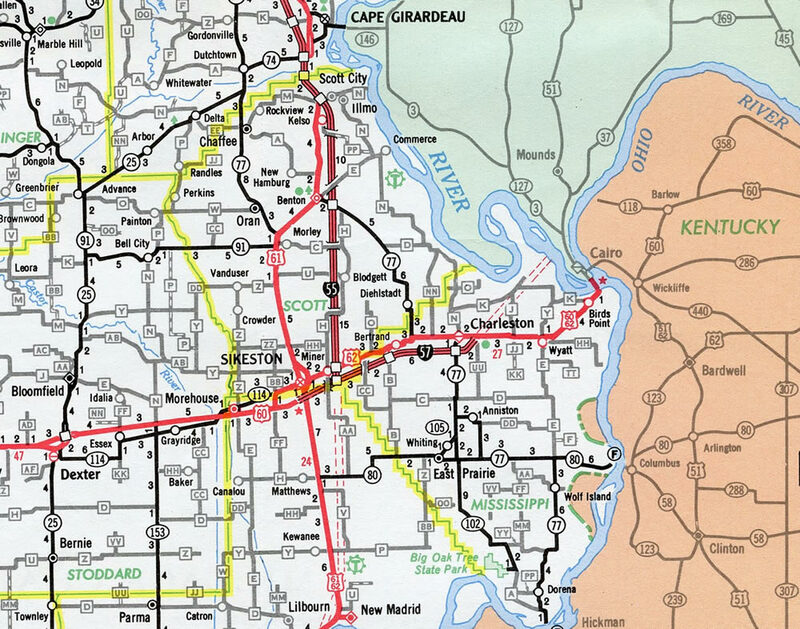 Interstate 57 combines with U.S. 60 and parallels U.S. 62 from Sikeston to Charleston in Missouri. U.S. 51 ties into the I-57 corridor from Cairo in southern Illinois, with the two paired northward until Dongola. Between Dongola and Effingham, Interstate 57 parallels Illinois 37. 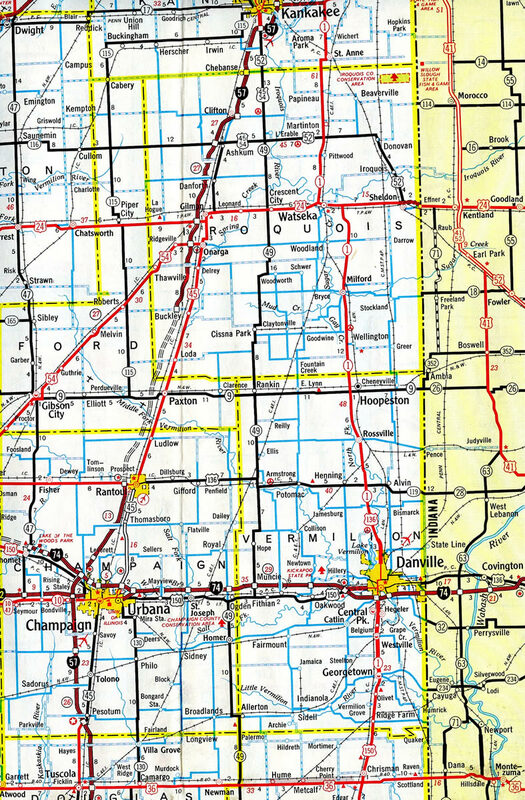 U.S. 45 accompanies I-57 northward from Effingham to Kankakee. North of Kankakee, Interstate 57 replaced former U.S. 54 (now Illinois 50 and Illinois 1). The establishment of Future Interstate 57 along the U.S. 67 freeway, from I-40 in North Little Rock to U.S. 412 at Walnut Ridge, was approved by AASHTO on September 24, 2017. Interstate 57 ended at U.S. 60 & 62 outside Charleston until 1978, when the freeway opened northward across the Mississippi River into Illinois. 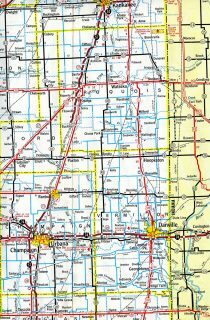 One of the last sections of Interstate 57 to open in Illinois was the stretch between U.S. 136 at Rantoul (Exit 250) and Buckley (Exit 272). Construction at Mount Vernon involved the overlap with Interstate 64. Started in July 2011, this project widened 4.7 miles of Interstate 57 to six overall lanes through the city, with working underway to December 1, 2013.8 The Mount Vernon widening was the first of the overall I-57 Corridor plan to expand the freeway to six lanes southward to Marion and Interstate 24. The first sign for Interstates 90 & 94 (Dan Ryan Expressway) along I-57 north appears 1.75 miles out at the Washington Heights neighborhood. Exit 357 departs next for Illinois 1 (Halsted Street) for the Longwood Manor community. Photo taken 06/20/15. Interstate 57 turns 90 degrees into the diamond interchange (Exit 357) with Illinois 1 (Halsted Street) on the final 0.75 miles to the Dan Ryan. IL 1 travels nearly the height of the state from its north end here at I-57 to Kentucky 91 at Cave-in-Rock. Locally Halsted Street forms a six lane boulevard north through Longwood Manor. Photo taken 06/20/15. The final shield assembly for Interstate 57 north stands ahead of the Parnell Avenue over crossing by the Fernwood neighborhood. Photo taken 06/20/15. The on-ramp from Halsted Street forms an auxiliary lane to Interstate 94 (Bishop Ford Freeway) south toward Calumet City, Lansing and Crete. Photo taken 06/20/15. The Interstate 57 mainline defaults onto the inbound Dan Ryan Expressway (I-94 west) to the Chatham, Englewood and Bridgeport neighborhoods ahead of the Chicago Loop. Photo taken 06/20/15. A pair of end signs for Interstate 57 line the northbound ramp to the Dan Ryan. Interstate 94 expands to ten lanes leading north from I-57 between Princeton Park and West Chesterfield. The Metra red line runs between the travel lanes along the expressway. Photo taken 06/20/15. Former signs posted along Interstate 57 north by 105th Street referenced the distance to I-94 (Dan Ryan Expressway) as 1.5 miles away. Replacements increased the distance by 0.25 miles and incorporated an internal exit tab for upcoming Illinois 1 (Halsted Street). Photo taken by Brian Dowd (12/23/02). A ground level sign was previously posted by the Halsted Street overpass for Interstate 94. It was removed by 2007. The northern terminus receives no exit number from Interstate 57. Photo taken by Brian Dowd (12/23/02). Historical look at the 99th Street on-ramp taking drivers from Illinois 1 (Halstead) street onto I-57 north. Like the last I-94 mainline exit prior to the northern terminus of Interstate 57, shield assemblies for the on-ramps approaching the junction include markers for both roadways. Photo taken by Don Hargraves (04/02). Construction completed in 2007 expanded the northernmost portion of Interstate 57 to eight lanes. The prior configuration saw two lanes joining the Dan Ryan inbound and one for the Bishop Ford outbound. Photo taken by Brian Dowd (12/23/02). The previous separation of traffic at the north end of Interstate 57. Traveling inbound on the Ryan Expressway, traffic will reach the Circle Interchange, where the Ryan and Kennedy Expressways (I-90 & 94) meet the Eisenhower Expressway (I-290) in 12 miles. Going outbound on the Bishop Ford Freeway, the junction with I-80 and the Tri-State Tollway (I-294) lies 11 miles to the south. Photo taken by Brian Dowd (12/23/02). The previous Interstate 57 end sign posted on the transition ramp to the Dan Ryan Expressway inbound. Photo taken by Don Hargraves (04/02). A companion Route I-57 Ends marker was posted on the left-hand side of the ramp to I-94 west. Photo taken by Brian Dowd (12/23/02). A begin I-57 sign was previously posted after the transition from Interstate 94 east. It was not retained during 2007 reconstruction. Interstate 57 (also known archaically as the Dan Ryan Extension) connects Chicago with suburbs such as Blue Island, Riverdale, Harvey, Markham, Country Hills, Matteson, Richton Park, Peotone and Kankakee. Photo taken 09/04/05. The first confirming marker for Interstate 57 south was posted at the Union Pacific Railroad overpass, just east of Exit 357 with Illinois 1 (Halsted Street) by the Longwood Manor community. Construction to expand I-57 here to eight lanes added a barrier to the right, with a new overhead posted for IL 1 and shield for I-57. Photo taken 09/04/05. Button copy sign formerly posted one mile ahead of the Bishop Ford Freeway end at Interstate 57. This sign was replaced a year later. Photo taken by Don Hargraves (04/02). A wye interchange connects Interstate 94 (Bishop Ford Freeway) with the Stony Island Avenue connector one mile east of I-57. This sign was replaced by 2012 to use Clearview font and later moved during construction to replace the overpass here. Photo taken by Chris Patriarca (05/25/03). This set of signs at the Cottage Grove Avenue overpass was replaced by 2011 with Clearview font based panels. The Story Island Avenue connector on-ramp adds a third westbound lane to the three wye interchange (Exit 63) with Interstate 57 south. The control city of Memphis is located 137 miles beyond the I-57 south end via I-55 through Missouri and Arkansas. Photo taken by Brian Dowd (10/26/02). I-94 (Bishop Ford Freeway) passes by the campus of Chicago State University to the Martin Luther King Junior Drive overpass. The left-hand lane departs just ahead for Interstate 57 south to Kankakee and Champaign-Urbana. Photo taken by Brian Dowd (12/23/02). Interstate 94 resumes a northward heading from Rosemoor to run along the Dan Ryan Expressway ten miles north to Downtown Chicago. I-57 south initially travels west between Fernwood and Longwood Manor before turning south through the southern Chicago suburbs for another 20 miles. Photo taken by Brian Dowd (12/23/02). Two miles north of the three-wye interchange (Exit 63) with Interstate 57 on I-94 (Dan Ryan Expressway) east at the 79th Street overpass at Chatham. Photo taken 05/09/10. Five lanes of the outbound Dan Ryan Expressway advance south from 87th Street between West Chatham and West Chesterfield to the separation with Interstate 57 at Exit 63. Photo taken 05/09/10. Exit 62 splits from the Dan Ryan Expressway for U.S. 12 & 20 (95th Street) as outbound motorists partition for Interstates 57 south or 94 east. Both routes will remain within the Chicago city limits for a few miles before exiting into southern suburbs such as Harvey, Calumet City and Riverdale. Photo taken 05/09/10. Exit 63 branches west from Interstate 94 as the Dan Ryan Expressway ends. Interstate 57 begins as the Dan Ryan Extension southwest to Morgan Park and Calumet Park outside the city. I-94 lines the Bishop Ford Memorial Freeway east through Rosemoor and south to the exchange with Interstates 80-294 (Tri-State Tollway) and Illinois 394. Photo taken 05/09/10. This sign bridge posted two miles north of I-57 was removed during reconstruction of the Dan Ryan Expressway in 2007. There are three remaining exits before the split at Exit 63. Photo taken 09/03/05. 2007 expansion of the Dan Ryan added a third lane for Interstate 57 south at Exit 63. Photo taken 09/03/05. This sign bridge was also removed during reconstruction of I-94. Note the button copy tabs for U.S. 12 & 20 (95th Street) and I-57 south. Interstate 94 uses the control state of Indiana, a concept common along the Illinois Tollway system. Photo taken 09/03/05. Two lanes previously separated for Interstates 94 east and 57 south respectively. A cut and cover tunnel system takes both I-94 east and the adjacent Metra red line below the northbound ramp of I-57 to the inbound Dan Ryan. Photo taken 09/03/05. Interstate 57 south & U.S. 60 west near the Scott County line on the two mile approach to Exits 1B/A with Interstate 55. Photo taken 06/01/11. I-57 & U.S. 60 bee line west southwest another mile to the full cloverleaf interchange with I-55. Saint Louis is a 140 mile drive to the north while Interstate 55 south leads 138 miles to Memphis, Tennessee. Photo taken 06/01/11. MoDOT typically posted end signs for Interstate highways and the southern terminus of I-57 is no exception. Photo taken 06/01/11. Exit 1B departs I-57 south & U.S. 60 west for I-55 north to Cape Girardeau, Jackson and Festus. U.S. 62 crosses paths with the freeway just to the north at east Sikeston. Photo taken 06/01/11. A loop ramp (Exit 1A) follows onto I-55 south to New Madrid, Hayti and Blytheville, Arkansas. Interstate 55 remains rural to West Memphis. U.S. 60 west meanwhile transitions into an at-grade expressway running along the south side of Sikeston to Dexter and Poplar Bluff. Photo taken 06/01/11. This guide sign posted at the gore point of Exit 1A was removed and replaced with a new assembly prior to the I-55 overpass. Heading south on I-55, a 7.7-mile exit less stretch ensues. Photo taken by Chris Patriarca (07/18/03). U.S. 60 travels along an expressway to bypass Sikeston to the south to the exchange with Interstates 55 and 57 (Exits 1A/B). Photo taken by Chris Patriarca (07/21/03). Exit 1A departs U.S. 60 east for Blytheville, Arkansas and Memphis, Tennessee as Interstate 57 north begins. Photo taken 12/20/09. Exit 1B loops onto Interstate 55 north to St. Louis as Interstate 57 & U.S. 60 commence a 12.3 mile overlap east to Charleston. Photo taken 12/20/09. The first shield assembly for Interstate 55 north stood at the bridge across North Cut Ditch. It was removed by 2007 and never replaced. Photo taken by Steve Hanudel (08/19/05). Interstate 55 traverses agricultural areas and parallels County AA north on the two mile approach to Exits 66A/B with Interstate 57 and U.S. 60. Photo taken by Steve Hanudel (08/19/05). One mile south of Exits 66A/B on I-55 north at the County AA overpass. U.S. 60 continues westward from Interstate 55 to Dexter, Poplar Bluff, and eventually Springfield and Interstate 44. The US route overlaps with I-57 east to Bertrand and Charleston. Photo taken by Steve Hanudel (08/19/05). Northbound Interstate 55 reaches the off-ramp (Exit 66A) for I-57 north & U.S. 60 east. I-57 travels 66 miles to meet the west end of I-24 on the mostly rural drive to Chicago. Photo taken by Steve Hanudel (08/19/05). 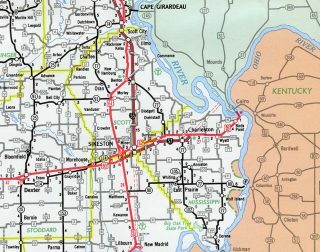 Interstate 55 advances a short distance south of U.S. 62 through east Sikeston to meet the south end of I-57 and U.S. 60. Photo taken 04/13/13. Exit 66B leaves Interstate 55 south for U.S. 60 across south Sikeston. The US highway varies between expressway and freeway on the corridor to Dexter and Poplar Bluff. U.S. 60 also provides the most direct route between southeast Missouri and Springfield, 221 miles to the west. Photo taken by Chris Patriarca (07/18/03). Motorists departing I-55 south via Exit 66A will reach the Windy City in 383 miles or Paducah, Kentucky via U.S. 60 east in 59 miles. Photo taken 04/13/13. “Interstate 57 Link Opens Today.” Chicago Tribune, November 6, 1963. “Cairo bridge final link in Interstate system.” The Southeast Missourian, June 25, 1978. “Governor Quinn Breaks Ground on $10.6 Million Widening Project for I-57 near Marion.” Illinois Government News Network press release, July 15, 2013. “Illinois’s first interchange of its kind opens in Marion.” The Southern Illinoisan, August 12, 2015. “I-57 widening project causes backups.” Mt. Vernon Register-News, January 19, 2013. “First phase of interstate project almost complete.” Effingham Daily News, September 14, 2012. “Interstate 57/70 project in final months of construction.” Effingham Daily News, October 4, 2015. Page updated October 12, 2017.